The final roster for the upcoming U20 World Cup was announced a couple weeks ago. There are hardly any surprises. Some players, like Kevin Harr and Kim Jungmin, were dropped – but again, if any players were going to get dropped it was probably going to be those two. In true Tavern style we will go through each position and review each player’s past performances, what they can bring to the team, and how strong their respective department is likely to be. Because this post got unbelievably long I am going to separate this into GK-DEFENSE for part one and MIDFIELD-ATTACK for part two – which will be out within the next few hours. Given that the same three goalkeepers have been playing for the team since time immemorial (barring injury), this is probably the department that we could predict with the most certainty. Some people will rue the absence of Kevin Harr but come on, he’s a couple years younger, not starting at Stuttgart, and despite a good 45 minute shift (and Ahn Junsoo’s horrific 45 minutes), would never displace the original three goalkeepers. The starter here, as everyone who watches this team would know, is Song Bumkeun. I have yet to make a negative comment about Song Bumkeun. I have never seen anyone make any negative comments about SBK. In fact, when the team played their friendlies in Germany, the opposition coaches singled him out as the best player on the pitch. With the NT goalkeepers, when the opposition makes a shot or breaks through the defense, you get extremely nervous right? But SBK knows exactly when to come off his line, and can make some truly fantastic saves when he’s at full stretch. Can we start fantasizing about finally having a decent goalkeeper on the KNT? I would like to think so, but given the K League’s poor track record with developing all our former goalkeeping talents (i.e. Lee Changkeun) let’s not get our hopes up too much. That being said Song Bumkeun seems to be a much better player than Lee was back in the day so … we will see how his career pans out. 범근이는 모든 사물과 상황으로 장난을 치는 아이죠. 눈에 보이는 모든 걸 이용해요. 재미있게 사는 유쾌한 친구입니다. 예를 들면 어제는 딸기를 주먹으로 부셔서 저한테 뿌렸어요(웃음). 매일 장난이 바뀌어요. He may or may not be negotiating with foreign clubs right now – it’s heavy speculation but it seems likely, especially from Germany. He said he would not comment on it until after the U20, which to me sounds like a pretty good sign? Lee Jun – maybe any other generation Lee Jun would be a national team starter. He’s played very well when he has been able to play, but the problem is, Song Bumkeun is the undisputed number one right now. He also chose the U League route after graduating from high school, and marshals the defense that consists of Lee Jungmun, Kim Minho, and Kim Seungwoo, all three of whom were called up to the national team (for those of you not in the know, Koryeo and Yonsei are rivals that happen to have particularly good soccer teams). Ahn Junsoo – I can say about Ahn exactly what I said about Lee Jun, except for the part where he took the U League route. Ahn chose to go to Cerezo Osaka instead, where he has not gotten playing time due to the presence of Kim Jinhyeon and one other Japanese goalkeeper. 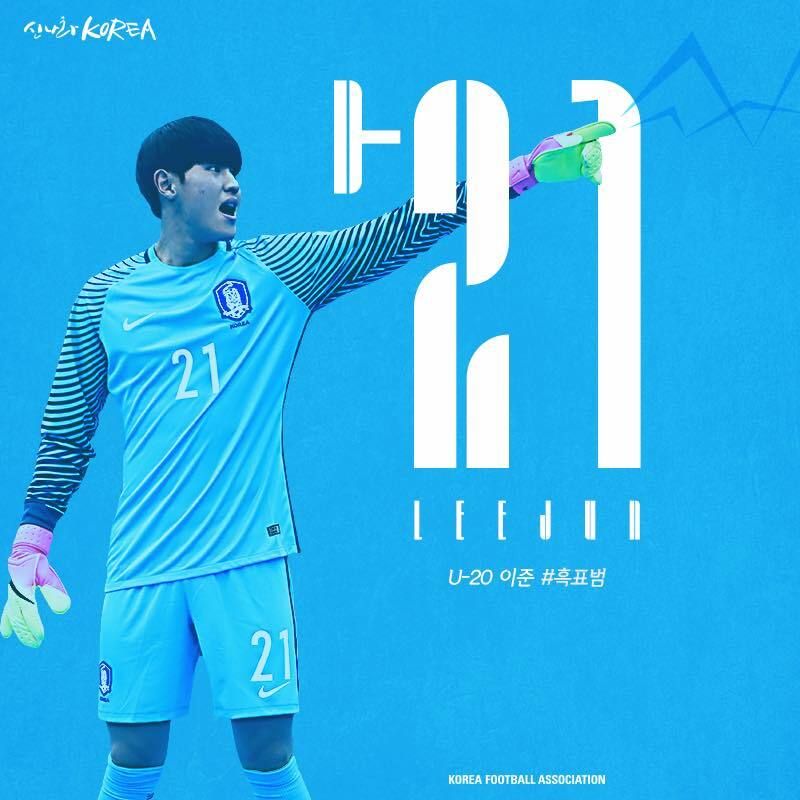 And once again, there’s not much I can say about Ahn Junsoo – he was the starting GK for the 2015 U17 World Cup and did a good job but there was nothing major I could judge about his ability. The only real blemish on AJS’s record is, of course, the horrible mistake he made in the recent tournament that got him substituted out in the second half for Kevin Harr. The other goalkeepers heaped praise on Ahn’s buildup play. Apparently he has an amazing eye for the pass – even in difficult situations with heavy opposition pressure he can find the right pass that splits the opposition pressure. Midfielder Lee Sangheon said he was amazed at Ahn’s ability to work the ball out of difficult situations and deliver it precisely to the defenders. Woo Chanyang is, personally, one of my favorite players on the entire team. He is most likely to play LB (maybe occasionally CB) for the national team, but due to his talent he’s played pretty much every position that isn’t goalkeeper or striker while on the Pohang U18 team. Unless we rest our starting XI sometime during the tournament, Woo Chanyang will most definitely start every game. WCY brings to the table a number of qualities that any team desperately needs – he is more than capable of last minute tackles (he made goal saving tackles against Nigeria and Jeonbuk Hyundai in particular), is extremely proficient in attack (he spent most of his Pohang Jecheol HS days as a left winger), has high workrate, and plays at least one good throughpass every single game (I mean it, his passing is actually really good). He also seems to have a very powerful shot, though I’ve only seen him shoot once or twice. In summary, Woo Chanyang is a player who can contribute equally well to the offense and the defense, and rarely gets caught out of position, although like all Korean defenders, makes the occasional mistake or two, most notably in a friendly against Brazil in which we drew 1-1 (back in 2016 I believe). Kim Minho: you might be very confused why his tag is “아저씨” (a term used for older men), but it’s a well deserved nickname. His teammates report being frightened upon first seeing him; he has no baby face like LSW/BSH (he has the opposite actually); and even us fans can point out that he actually looks like a man among boys whenever he plays – that’s how well built, tall, and imposing he is. He’s an incredibly tough and strong defender who, if could be featured on FIFA17, would have at least an 80+ strength rating (they gave Hong Jeongho 85 at the peak of his Jeju days and Kim Minho surely surpasses HJH in that regard). 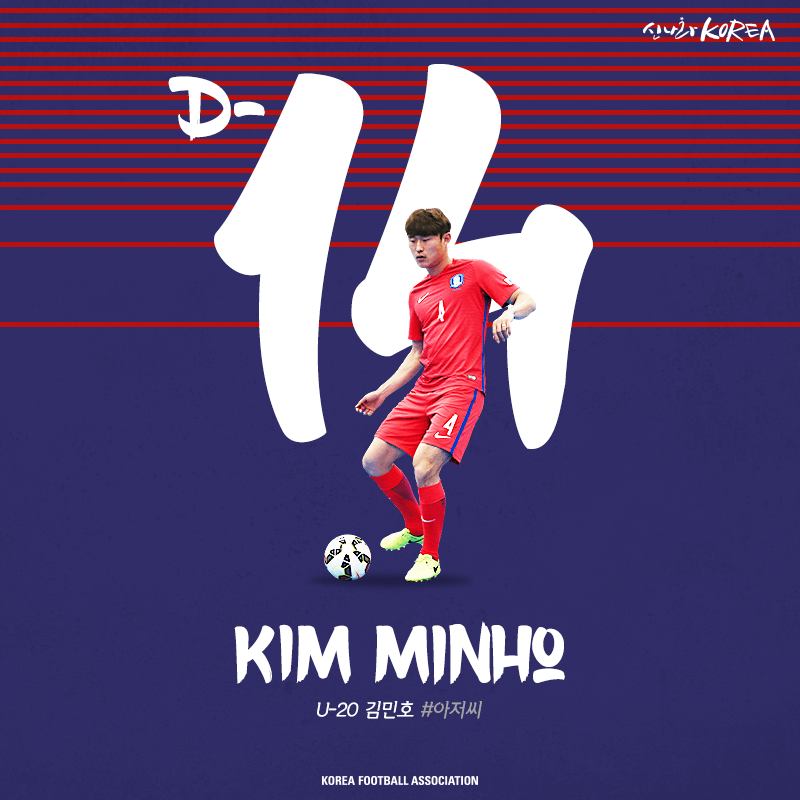 Kim Minho was a favorite of Ahn Iksoo’s for this reason, and played almost every U18 game back in 2015, but he had a very tough time after entering Yeonsei and didn’t get to play for either club or country for a while. Lim Minhyeok actually heaped a good amount of praise on Kim Minho – according to LMH, Kim Minho is a CB who’s very easy to play with because when midfielders come downfield to retrieve the ball, Kim Minho will actually pass you the ball. Apparently, when CB’s see opposition players pressuring the midfielders, they will often long ball it or pass the ball to the keeper as opposed to letting the midfielders fight the pressure and bring it up, which makes the midfielders often exasperated (I actually have heard that midfielders actually have this pet peeve). So LMH concludes by saying that Kim Minho is one of the players who really trusts the midfield players to do their thing. 동료에 대한 신뢰도 김민호가 가진 장점이다. 임민혁은 “미드필더인 내 입장에서 (김)민호의 최대 장점은 미드필더가 공을 받으러 나왔을 때 공을 꼭 준다는 것이다. 미드필더가 공을 받으러 나와도 뒤에 상대 수비가 붙어있으면 공을 안 주는 수비수들이 더러 있다. 그럴 경우 미드필더는 맥이 빠진다. 민호는 미드필더를 믿고 플레이하는 수비수다. 개인적으로도 민호에게 이런 이야기를 한 적이 있는데, 그 뒤로 공을 더 잘 주는 것 같다”며 고마움 섞인 미소를 지었다. One of my favorite pictures is of Kim Minho against Myongji University. Just look at that size..
Lee Jungmoon – the most recent addition to the team – is tied for the tallest player on the team at 195 cm (6’6” – 6’7”). According to teammate Kim Seungwoo, LJM is very strong in the air (seems about right) and has great footwork despite his insane height. When asked to compare LJM to Jung Taewook, Seungwoo replied that while Jung TW has better physicality and one-to-one marking, LJM is more proficient at build-up play. It turns out that Lee Jungmoon uses both feet very proficiently, which STY noted as a factor in his last-minute inclusion. He learned to use his left foot because of an injury to his dominant right. Let this be a lesson to all you aspiring footballers out there – injure your dominant foot sometime and then you can learn to use both feet! “제공권이 강점이다. 그런데 키가 크면서도 발밑이 좋은 편이다. 태욱이가 몸싸움과 일대일 마크에 강점이 있다면 정문이는 빌드업에 강점이 있다”고 설명했다. Kim Seungwoo is a bit of a rising star in the team right now. From being pretty much unknown (he was called up to the U17 WC but only got minor sub minutes) to being called up multiple times under Shin Taeyong and playing surprisingly well – Lee Jinhyeon may be the official “Cinderella” of the team, but Kim Seungwoo would take that title if it wasn’t for Lee Jinhyeon meteoric rise. 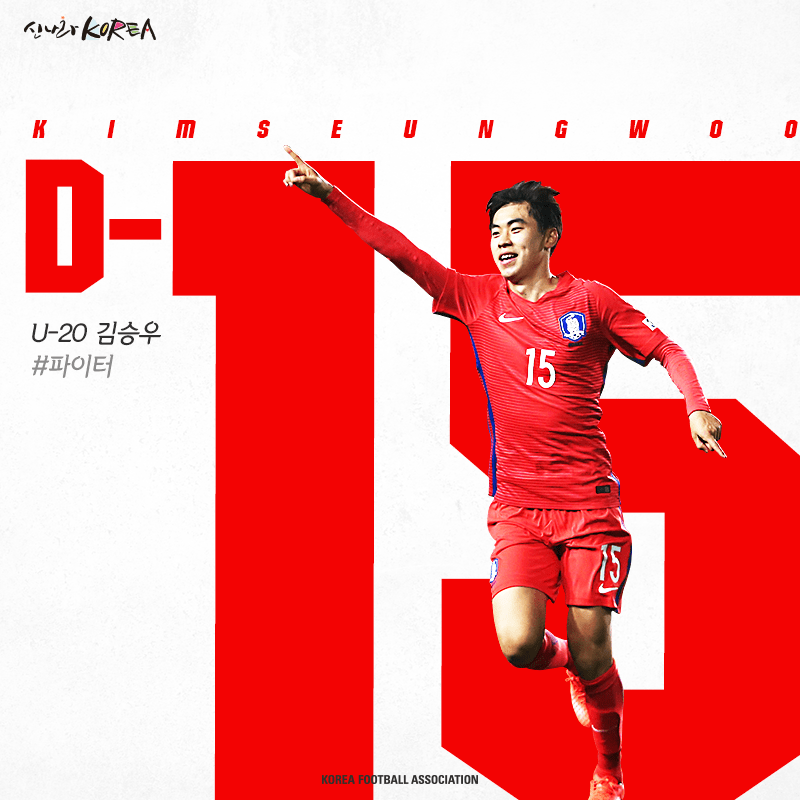 Kim Seungwoo – nicknamed “The Fighter” in the above graphic – really is a bit of a ball-chaser in defense, but unlike say Han Kook Young, is very good at passing and keeping a counter attack alive. I think Kim SW likes long-passes a little too much for my liking, but he never kills tempo or loses the ball uselessly. A player I’ve grown to like quite a bit nowadays. I wrote about him already in our Adidas 4 nations cup review, but I think Kim Seungwoo really showcased his abilities in the friendlies against Uruguay and Senegal. We all had seen him play as a defensive midfielder and as a centreback, but in these two friendlies Kim SW played as the middle CB/sweeper in the 3-4-3 system and played better than I expected him to. I once said that Lee Seungmo and Kim Seungwoo would be in direct competition with each other, but I’m starting to see that the two are very different players. After all, Kim SW plays CB for Yeonsei while Lee SM plays AM for Pohang – Lee Seungmo has played CB once in a while, but probably would not fare very well in a three back line. Fun facts: Kim Seungwoo is apparently one of the livelier personalities on the team, always listening to hip-hop/club music and occasionally breaking out in dance. Jung Taewook and Lee Sangmin – Ever since the incident where Lee Sangmin helped save Jung Taewook’s life after a nasty collision against Zambia (and since STY has made it pretty clear that these two are the first choice CB’s), these two have been nearly inseparable. In pictures they’re together; in the media they’re usually mentioned together; this incident seems to have brought them even closer than they already seemed to be as teammates. For a defender, height is a great advantage. Yet JTW is very fast for his height – he never gets outrun by opposition attackers and usually wins his 1 on 1’s with his strength. He has so many admirable qualities as a defender. When I first joined up with the U19 team, I saw a player who was as tall as me. [Both are 195cm]. Because we had such a similar build I knew I would have to compete with him. Taewook hyung is very tough and strong – he knows how to bully opposition players off the ball or break them in a tackle [break is used differently in Korean fyi this does not imply physical harm]. I think I’m a little better with footwork though [laughter]. In Portugal i was able to play alongside him and our teamwork was very good. Surprisingly, not a single one of them mentioned his incredible set piece threat – he’s actually insanely good at scoring headers, though I guess the whole 195cm thing helps a lot. We speculated that for this heading reason alone JTW would be a starting CB, but he’s more than proved himself on the ground as well as in the air. 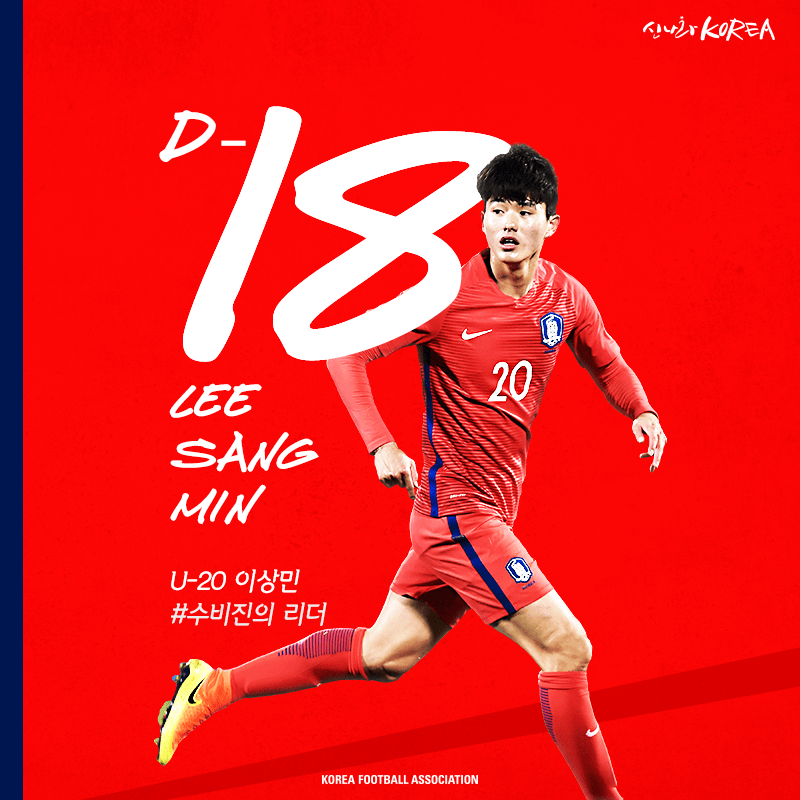 Lee Sangmin, of course, endeared himself to fans at the U17 level, even after the mishap against Belgium in the round of 16, and now is ready to endear himself to us again at the U20. He actually captained the team against Uruguay and Senegal despite being a year younger than everyone on the team – considering the premium Korean culture places on seniority, this is quite a significant gesture that speaks quite a bit to how respected LSM is on the team for his leadership qualities. And he was rock-solid in both those games as a defender as well. Lee had a bit of a slump himself like Kim Minho did, but he seems to have fully recovered – seeing him play in the Uruguay friendly really solidified this sentiment for me. I am very close to Sangmin hyung and he is a great person to be around. He isn’t super funny or humorous but he takes care of you and watches out for you as if he was a [biological] brother. He leads the backline extremely well, and as an offensive player it is very reliable to have someone like Lee Sangmin at the back. 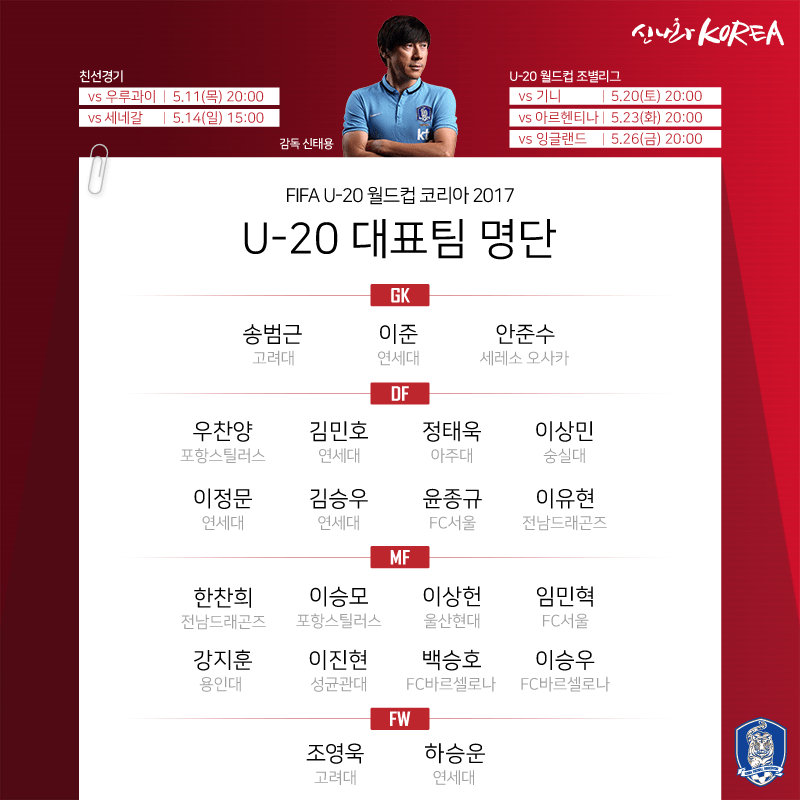 Yoon Jonggyu – the high flying right back from the 2015 U17 World Cup who recently signed for FC Seoul – is back and likely to play as the starting RB this time as well. You will see that his hashtag says “U20 Lee Keunho” – because if you look at his face he actually does have this striking resemblance to Lee Keunho. 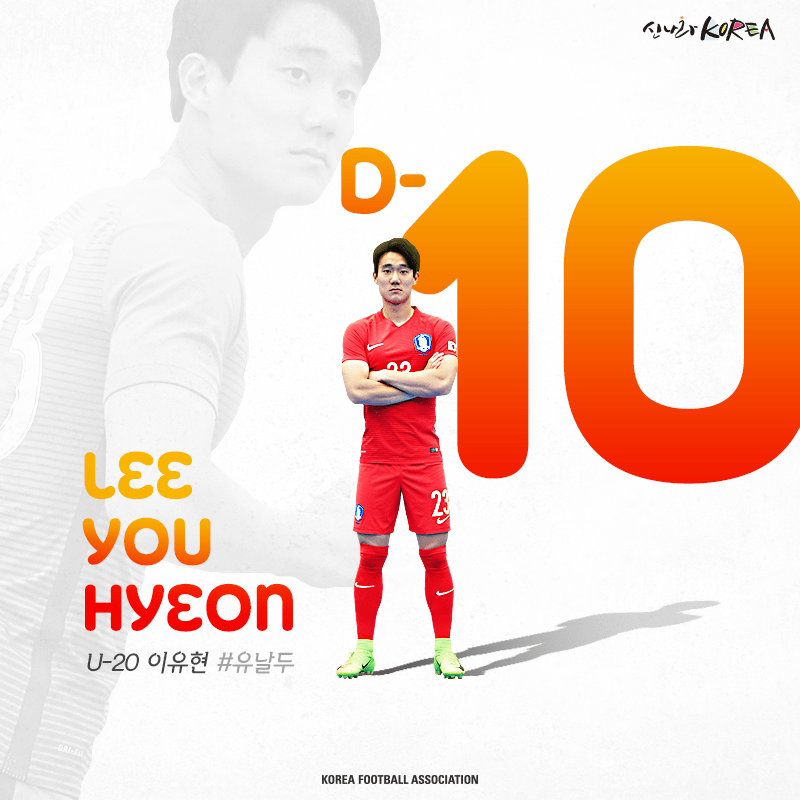 But he is determined to make himself known as the U20’s Yoon Jonggyu, not U20’s Lee Keunho. Yoon Jonggyu, according to his teammates, is a guy who does not listen to his sunbaes and fools around a lot, but the seniors seem to be okay with it. Seoul teammate Lim Minhyeok says that even though he never listens, they are good friends; and Kang Jihoon says that Yoon never calls him hyung, but accepts that it’s just his style. This actually makes all too much sense. I think that if there is one player who really embodies Shin Taeyong’s all out direct attacking style it’s Yoon Jonggyu. Yoon Jonggyu, just like Woo Chanyang on the left, is a high energy player who sort of just does what he wants. At one moment he will be defending, but at another moment he’ll be cutting in from the right flank trying to shoot. Like most fullbacks in Korea he played on the wings for club, so it makes sense that he racks up assists and is very good at overlapping runs down the right. Kang Jihoon notes that YJG actually has a surprising degree of technical skill, and will surely help the team tremendously in their campaign. Lee Yoohyeon – a relative newcomer to the team who impressed greatly in the recent friendlies – apparently is addicted to weight training. Just looking at his picture it makes sense – he may not be as big as Kim Minho but you can tell that he lifts. Lee Yoohyeon’s teammates say he is a quiet, reserved type who works incredibly hard. Like most he started as a forward before switching to fullback, and understandably, his idols include Cristiano Ronaldo and Phillip Lahm. The switch seemed more than successful – he found great success as a fullback for Jeonnam U18, and at the recent Suwon Continental Cup against Iran England and Nigeria, he was awarded MVP for his two insane freekick goals and fantastic overall defensive performance. For a fullback to get the MVP, ahead of Lee Seungwoo and Baek Seungho, is quite impressive. Though the freekicks had a lot to do with it, it was still an impressive performance. Without a doubt, Lee Yoohyeon has the best freekick technique out of everyone on this team. But you can’t start just because you can take a mean free kick – Lee Yoohyeon got injured shortly after that tournament in which he was awarded MVP and that period just happened to coincide with the resurgence of Yoon Jonggyu. Lee Yoohyeon will certainly get playing time if either Woo Chanyang or Yoon Jonggyu, however, and he would certainly be a reliable candidate to replace either of them. This is fantastic! I’m very much looking forward to read part 2 of this! Coming up in just a couple hours, I see it sitting in drafts scheduled to post! I’m wondering, where’s Jang Gyeol Hee? I’ll try to give Jinseok a wave so he can answer better than I can but if I recall well he’s at Juvenil A with Lee Seungwoo but he’s been moved over to leftback. Shin Taeyong called him up a couple times in training camps and maybe a closed door friendly but he’s decided Jang isn’t at the U20 level right now. Of the three La Masia players it seems that Jang is struggling the most.